All Data that is stored as Pimcore Assets can be accessed via its URL (e.g. https://mydomain.com/my-assetfolder/my-asset.jpg) and therefore is public available without login or other access restriction! As a consequence confidential data must not be stored as Pimcore Assets without additional protection measures. The reason for this wanted behavior is performance. Delivering an asset directly via the web server needs significantly less resources than starting a php process for every asset request (especially when it comes to delivering thumbnails). All confidential assets need to be stored within one (or a few) folder(s), e.g. within /protected (to set up Pimcore backend permissions this is necessary anyway). In the .htaccess of the project, the access to this folder has to be restricted with an additional rewrite rule. It is important, that this rule is placed in front of the rewrite rule for asset delivery. Because of this rule, all assets located within /protected (also all their thumbnails) are not delivered via the web server anymore. As a consequence also using the direct link for downloading or using the Pimcore generated img tags for thumbnails cannot be used anymore. All delivery of these assets has to be done manually via a custom controller action. This option does not restrict the delivery in general, but routes the asset request to a controller action that can check access permissions with custom business logic and then deliver the asset or not. 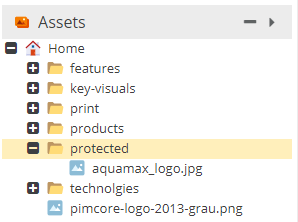 Again all confidential assets need to be stored within one (or a few) folders, e.g. within /protected. In the .htaccess of the project, requests to assets of this folder need to be routed to app.php. Again, it is important, that this rule is placed in front of the rewrite rule for asset delivery. // important this has to be the first route in the file! // Add your code here to check permission! Of course this option has significant impact on server load and delivery performance of assets (and thumbnails). Therefore it is not suggested to deliver all assets that way but only the confidential ones!